Chris O'Brien is the European Correspondent for Trucks.com. He is a journalist based in Toulouse, France, and also writes for VentureBeat. He spent 15 years covering Silicon Valley for the Los Angeles Times and San Jose Mercury News. He can be found on Twitter: @obrien. Peloton Technology co-founder Josh Switkes explains why self-driving truck tech has moved from fringe concept to hot investment. Convoy Chief Technology Officer Grant Goodale explains how the Seattle-based on-demand trucking start-up has attracted investment from some of the biggest names in tech. Trucking is attracting growing interest from high-risk investors, including some who see logistics and shipping as the key to enabling even greater economic innovation. Seattle-based Convoy announced today that it has raised a fresh round of investment capital from a long list of notable tech names that includes Microsoft's Bill Gates. Traft, one of Russia’s largest trucking companies, has big plans for autonomous trucks, but wants to ensure truckers can still come along for the ride. Self-driving trucks will slash trucker jobs by at least 50 percent in the U.S. and Europe by 2030, according to a new report from the International Transport Forum. Nvidia sees its new partnership with Paccar — maker of Kenworth and Peterbilt trucks — as key to the tech company's self-driving truck ambitions. Daimler Trucks researchers have found that putting artificial daylight in truck cabs at night improved the performance and well-being of drivers. 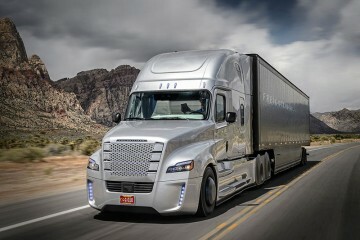 Daimler is looking how to add such a feature to its trucks. Daimler Trucks is looking to become more entrepreneurial through its Digital Solutions & Services division. The first push will be to turn its FleetBoard trucking information system into an industry app powerhouse. Mobile World Congress displays show how wireless world is looking to transportation and trucking to replace business lost to slow down in smart phone industry. In Europe, autonomous buses are successfully moving passengers both short and long distances, and related self-driving technology is proliferating among crowded cities seeking new public transportation options for commuters. Opinions are split as to whether the U.S. or Europe is ahead in self-driving truck development. But there’s agreement that the competition to stake a claim to be first with a technology that promises to revolutionize commerce is intensifying.